Use Canva to combine photos, textures, and colors to build a fashion photo collage that will turn heads. Design an eye-catching fashion photo collage fit for a magazine spread. Colors, fabrics, shapes, and accessories together can define a look and communicate a style. Whether you’re building an outfit or showing off a high-fashion concept piece, you can make your statement with a fashion photo collage. We have everything you need: an array of design grids to frame your images, oodles of drag and drop illustrations, and built-in photo filters to give your fashion shots the smokey afterglow you’re looking for. It’s time to start designing! 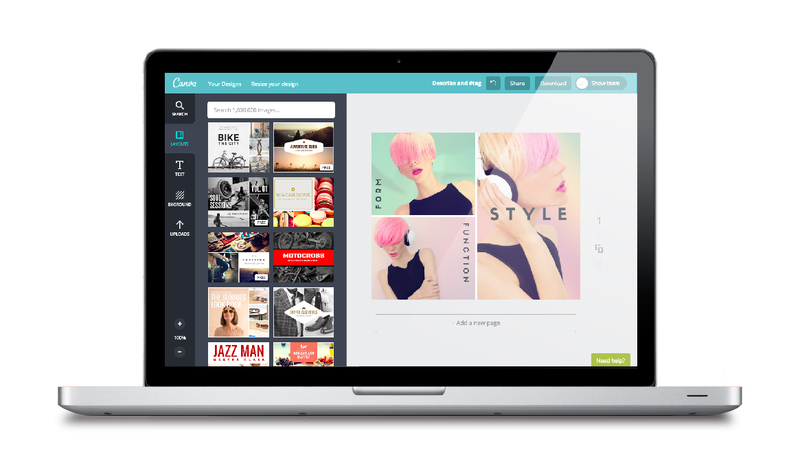 Create a new Canva account to get started with your own Fashion Photo collage design. Start building your fashion photo collage by choosing a design grid and filling it with glamorous photos from fashion blogs, Pinterest, or whenever you see something gorgeous. We make it easy to upload all your favorite fashion photos to the cloud, ready to insert into any design. Can’t find a photo of cute boots or an enveloping anorak? Never fear! Search our vast collection of over 1 million stock photos to find what you’re looking for. With many images available for free and premium photos priced at only $1, you can add all the right pieces to your collage, from the top of the head to the tips of the toes. Show your enticing spread to all your followers! With one click of the “Share” button, your fashion collage can be ready to post on Twitter, Facebook, or wherever you preview your fabulous taste. Want to start your day with fashion inspiration? You can print your fashion collage to post on your wall or hang next to your floor-length mirror. Simply download your collage as a high-quality PDF to send to a print professional for printing, framing, and more. Do you have friends who share your style? Create a fashion collage together! Canva can be a fashionista pinboard for you and your BFFs. Whether you’re chatting on the couch and clicking through our free iPhone, iPad or Android apps, or working on opposite sides of the globe, we store all your designs in the cloud, so you can build and share your photo collage anywhere.